While reﬁtting our demo suite, I began to consider the virtues of AV furniture designed for commercial, presentation and education purposes. After talking to suppliers Bjurab Euroscreen, I believe there are a good number of domestic users who might be interested, too. Many of you will have equipment sitting on a stand or in a rack; but shifting such a stack around, for improved temporary access, is generally a major undertaking. Not so with the Euroscreen AV Cabinet. 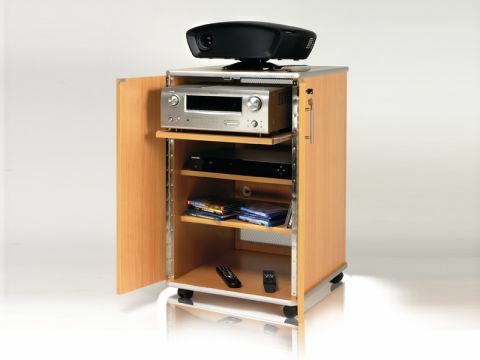 Your amp, player, and maybe a games console can be ﬁtted inside, along with a small projector, or a larger one on top. Just disconnect the speaker cables and close the doors, and you could roll the whole lot into another room if you feel the need. The Swedish-designed cabinet is beautifully made and has three internal shelves, two adjustable, and the top shelf can slide out up to 26 cm for easy access. Both front and back doors are lockable, and the rear door has substantial ventilation grilles to avoid overheating issues. The back and the top have cable access ports, and the cabinet is mounted on four solid castors. There's also an option to have 19in rack mountings ﬁtted. ● The cabinet makes it easy to lock all your AV equipment away out of sight – it also makes it easy to move it around when the need arrives. ● Setup and running are no problem due to the cabinet's cabling and ventilation features. ● Looks a bit industrial, and if you like to do a lot of repatching of cables, the rear door may be a hindrance.